“They broke the contract we had,” Devaughndre Broussard said of former Your Black Muslim Bakery leader Yusuf Bey IV and bakery member Antoine Mackey. Broussard is the prosecution’s key witness against the men, who are facing triple-murder charges in connection with Bailey’s death and that of two other men. Monday was the third long day of testimony for Broussard, who will receive a 25-year sentence in exchange for his cooperation. His wide-ranging testimony included a description of shooting Bailey, and culminated with an aggressive cross-examination by Bey IV’s court-appointed lawyer. Also Monday, a juror was dismissed from the case, which led Mackey’s lawyer to ask again that the case be moved out of Alameda County. Defense attorneys had earlier tried to have the trial moved from Alameda County, citing extensive pretrial publicity. Much of the case hinges on Broussard, who has confessed to shooting Bailey and another man, Odell Roberson, and said Bey IV ordered both hits. Mackey is accused of helping in those two deaths, and with killing a third man, Michael Wills, also allegedly at Bey IV’s order. Bey IV and Mackey, both 25, have pleaded not guilty; they face life in prison without the possibility of parole if convicted. 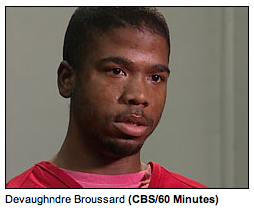 In morning testimony, Broussard testified how he killed Bailey on Aug. 2, 2007. He said he shot him twice with a shotgun, started to run away, then returned to stand over the dying 57-year-old journalist to fire a third shot into his face. Broussard also testified how police used Bey IV to help give what he now says was a flawed confession; Broussard first told police he acted alone when he killed Bailey. Prosecutor Melissa Krum ended her questioning by asking Broussard why he decided to turn against Bey IV, his former religious leader, and Mackey, a close friend. Broussard said it was partly to get a plea deal, and partly because he was angry over how they treated him after his arrest. Under Peretti’s questioning, Broussard admitting lying to police numerous times about the killing and changing his story repeatedly. Peretti played an unedited tape of Broussard’s fall 2008 interview with the CBS News show “60 Minutes,” in which he denied killing Bailey. Monday’s proceedings were difficult for Bailey’s family, several of whom have attended the trial since it began March 21. Broussard is expected to take the stand again Tuesday for additional cross-examination from defense attorneys.